What is the Spam Fighters program? 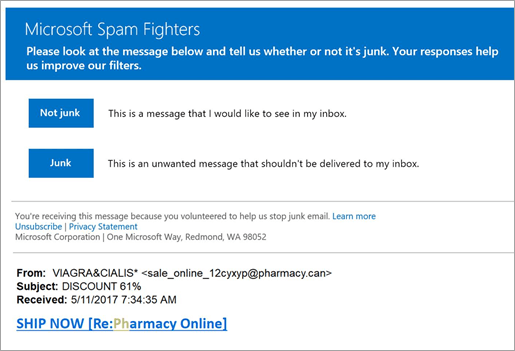 The Spam Fighters program helps us improve the junk mail filters in Outlook.com. If you accept an invitation to join the program, we’ll periodically send you a copy of a message that was sent to you and ask you to vote on whether it’s spam. After you vote, we compare your answer against those of everyone else in the Spam Fighters program. This comparison helps us improve our junk mail filters. We’ll only send you messages from your own email, so you’ll never see anyone else’s messages. You’ll never receive more than one message per day, and you can stop participating at any time by clicking Unsubscribe in the message. If you're a member of the Spam Fighters program, thank you for your participation. For more details, see How the Outlook.com Spam Fighters program works.